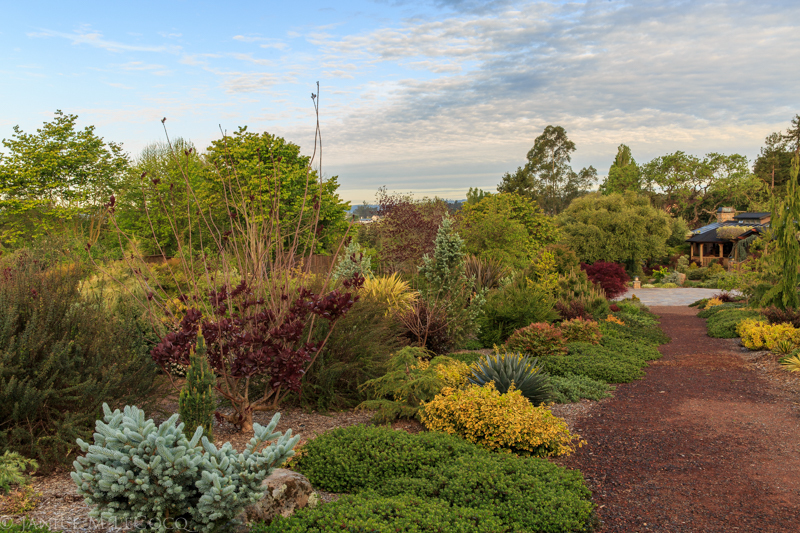 Succulents seem to be all the rage these days, with specialty nurseries and designers abounding. We admire many of the succulent creations, but never really embraced the ‘total look’, which seemed often to lack scale and suffer from excessive cuteness. 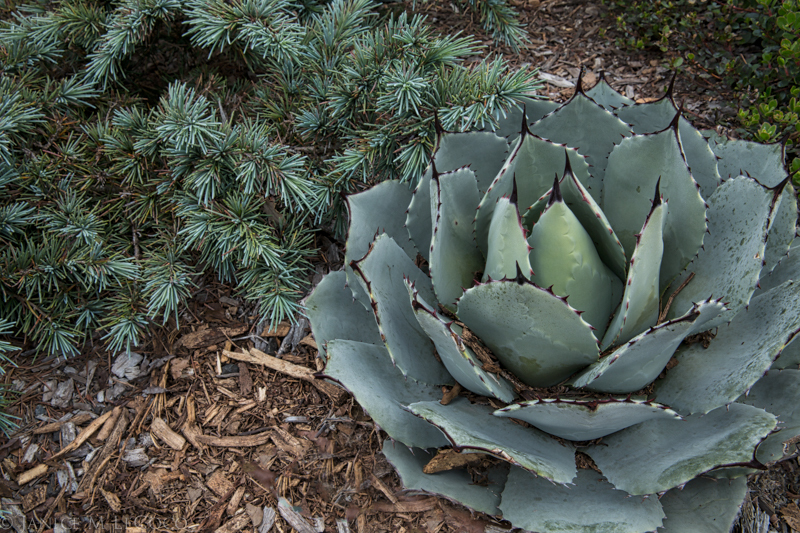 When we focused on some of the edgier genera, with larger specimens, such as Agaves, we also realized that we didn’t need to isolate succulents in their own beds and containers, we could incorporate them into the overall garden design. 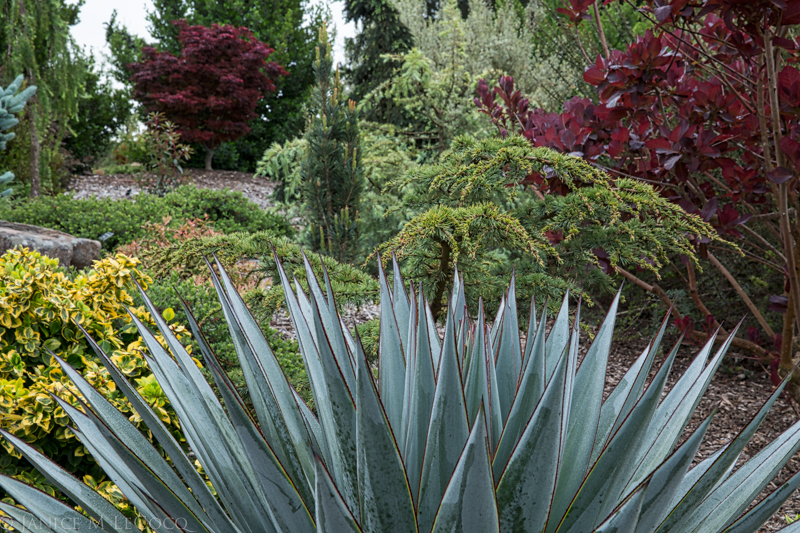 Agave ‘Blue Glow’ can hold its own beside conifers (in this case Chamaecyparis pisifera ‘Golden Girl’, Picea pungens ‘Glauca Procumbens’ and ‘Picea orientalis ‘Golden Start ‘) and other woody foliage plants. 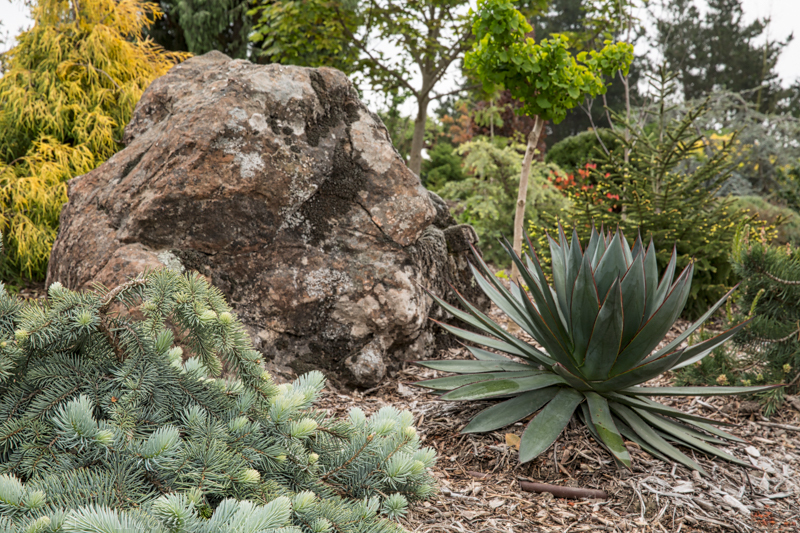 A study in dusty blue: Cedrus deodara ‘Prostrate Beauty’ and Agave parryi var. huachucensis share the same hue, but with vastly different structures and textures. 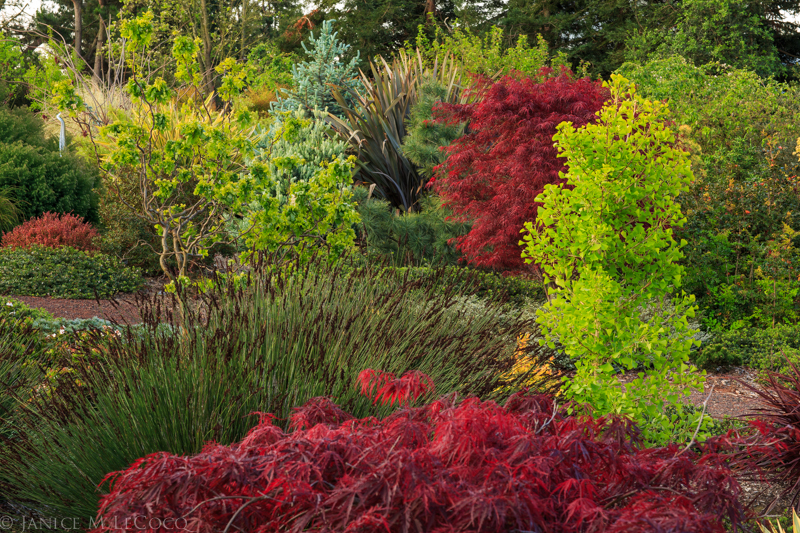 Foliage gardeners continually must grapple with the fact that most of the interesting foliage plants have small leaves. 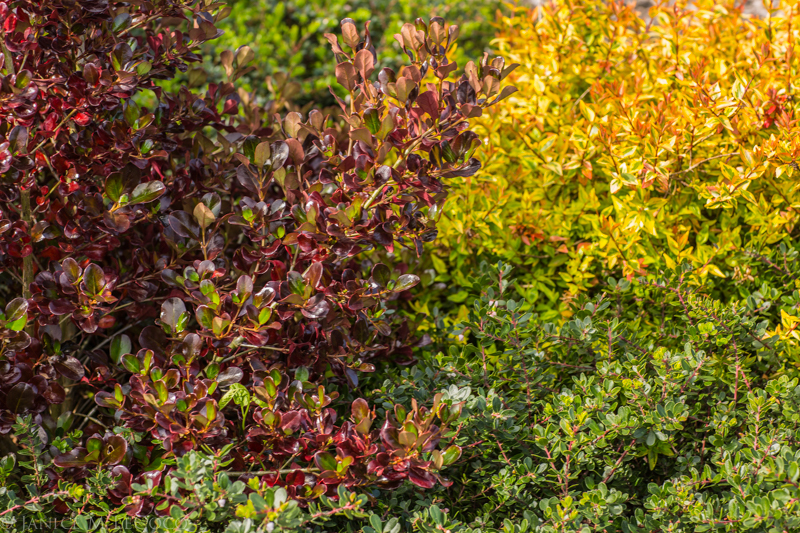 From the conifers’ needles to shrubs such as Abelia, Berberis and Hebe it is difficult to get away from fine textures. 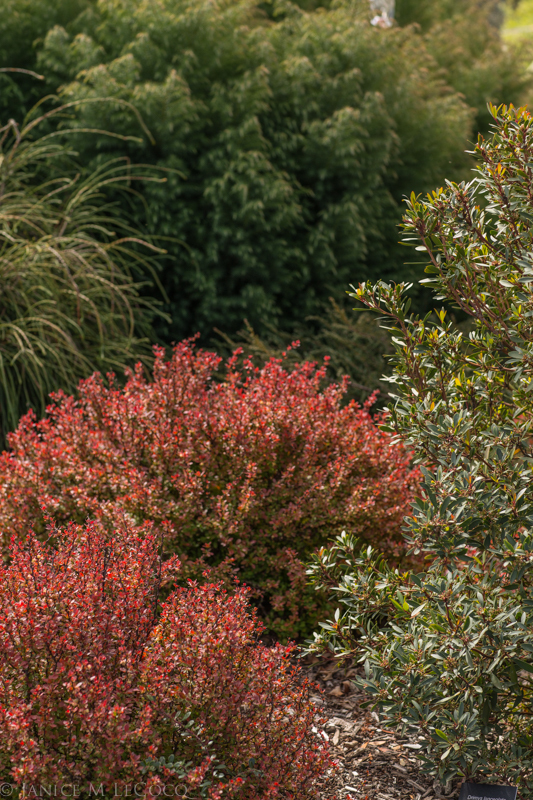 Most of the large-leaved shrubs, such as Rhododendron and Pieris, are denizens of the woodland garden and not happy in sunny gardens without acid soils. 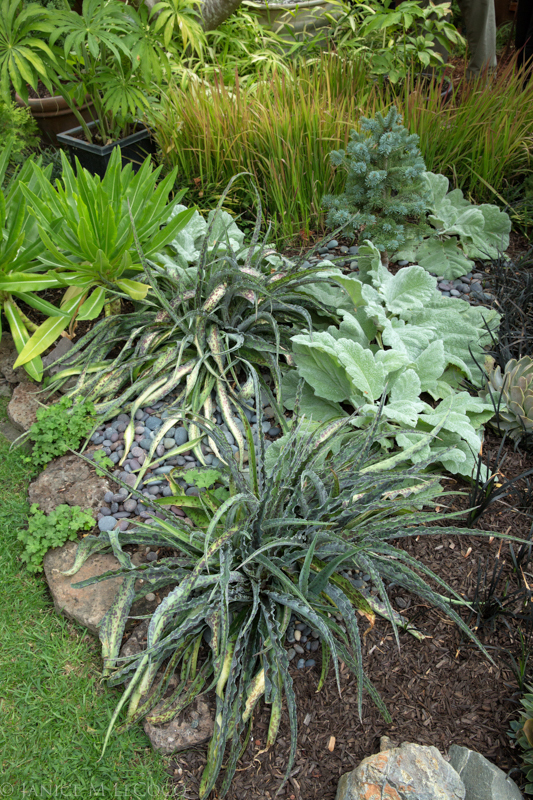 Many succulents provide large scale leaves that beautifully contrast with finer foliage. 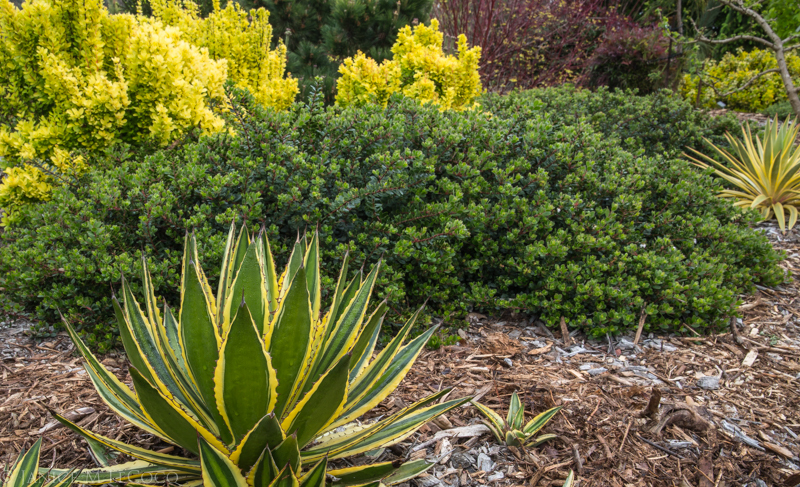 Agave lophantha ‘Quadricolor’ and Juniperus x media ‘Daub’s Frosted’ share the same yellow and green foliage colors. 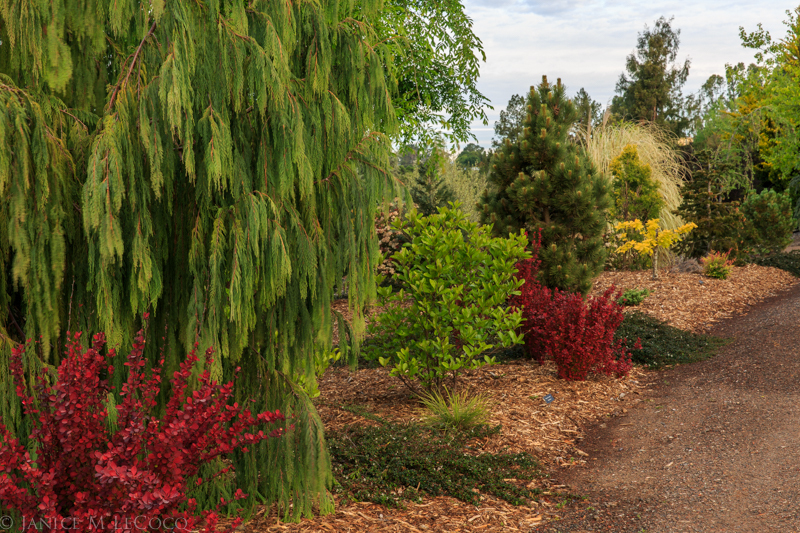 Pinus strobus ‘Mini Twists’ is to the right. 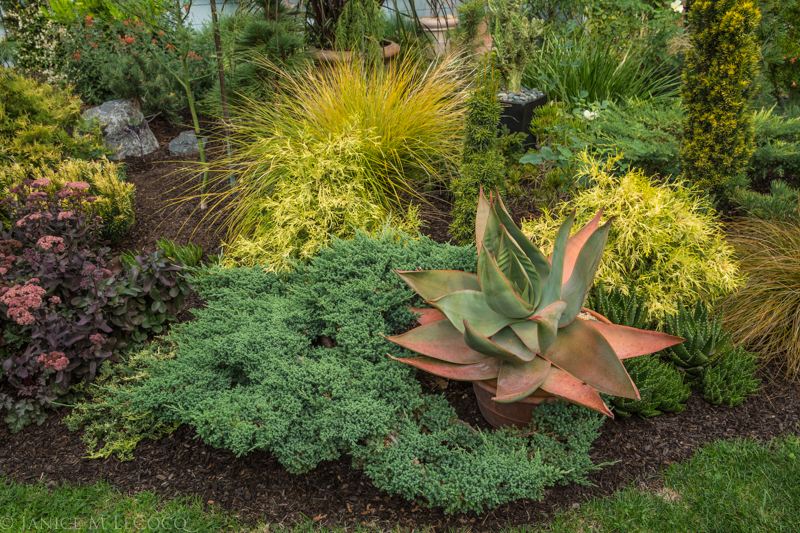 The idea of interplanting succulents with conifers and other foliage plants strikes some as odd if not downright unnatural. To get a taste of how Nature herself does it, visit a forest in Mexico and see Yucca and Agave growing side by side with pines and cypress. 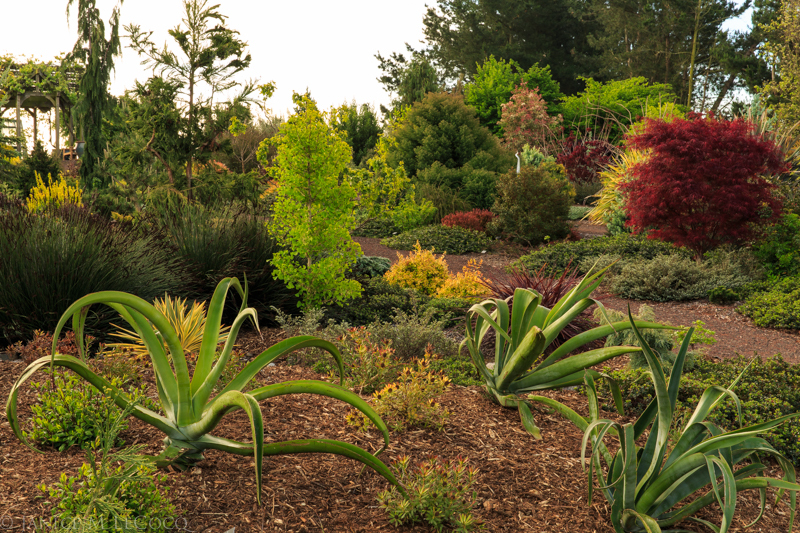 We think of Mexico as a succulent haven when in fact Mexico also has more native pine species than any other country. Many of our perceived design rules are products of our own traditions and not necessarily representative of what is possible or, indeed, even plentiful in Nature. 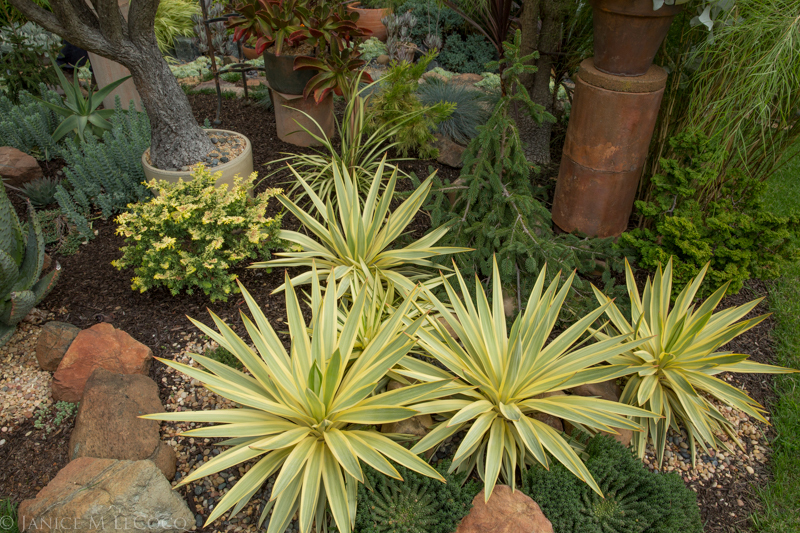 Yucca ‘Tiny Star’ and other succulents with coniferous accompaniment. 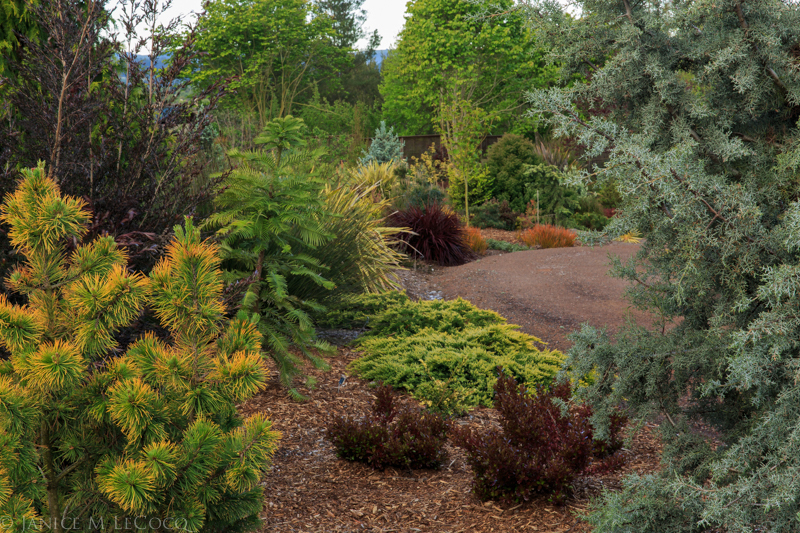 The conifers echo the yellow in the Yucca and soften its sharp lines. Succulents come in a vast array of colors although most of the genera with larger species (Yucca, Agave, Aloe, etc) have the most selections in shades of green, blue and yellow. It is not uncommon to find multiple colors with either stripes, such as many Yucca and Agave, or marginal accents in contrasting shades. 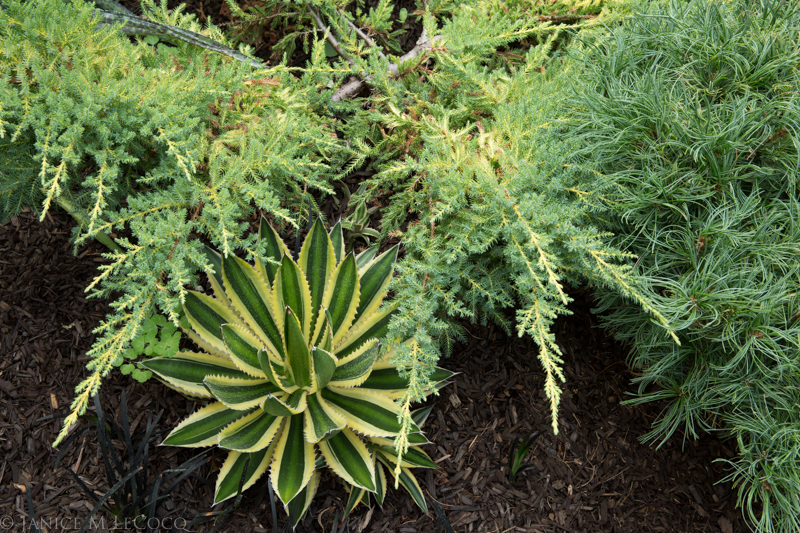 Aloe striata in a bed of Juniperus procumbens, flanked by golden Chamaecyparis. 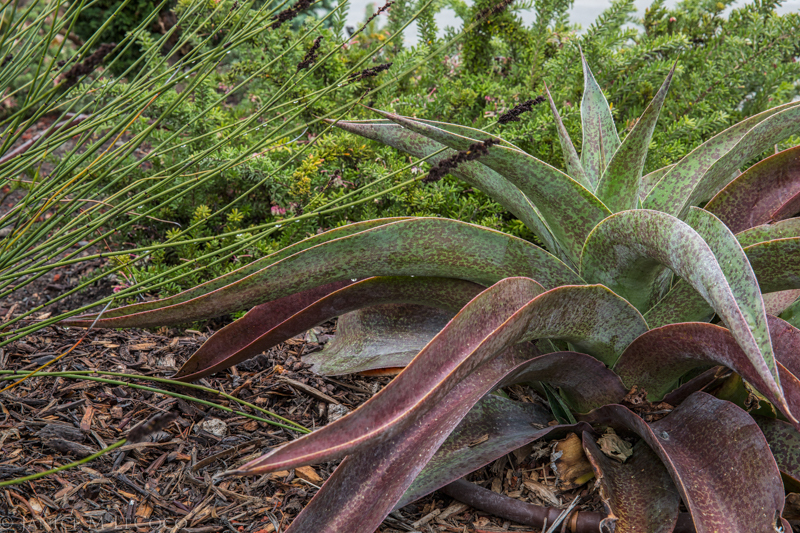 Aloe striata has coral leaf margins and in shade, rosettes of broad, flat, bluish-green leaves. 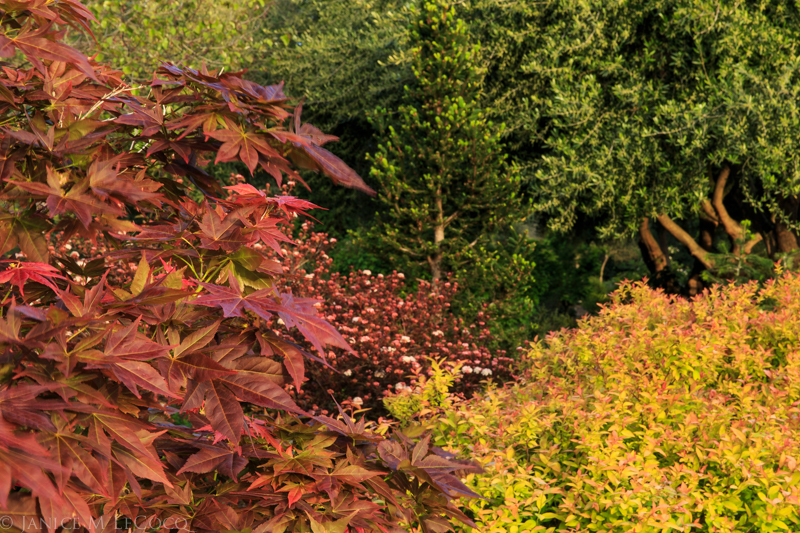 The leaves turn ruddy pink in full sun and make for a beautifully two-toned plant. In the photo above, the blue-green of the Aloe is echoed by the juniper, again with a marvelous textural contrast. The Aloe is hardy to only 20 degrees, so in this garden is planted in a container, which may be moved to a protected area when necessary. Mangave ‘Macho Mocha’ is one of the few larger succulents with significant maroon coloration. There are larger succulents with maroon foliage. Some of our favorites are the Mangaves, thought to be crosses between Agave and Manfreda. ‘Macho Mocha’ is a stunner; it reaches 4-6′ across at maturity and its broad, strappy leaves are liberally peppered with deep, bronzy red. Mangave ‘Chocolate Chip’ has distinctively wavy leaves, which contrast nicely with the other foliage. There are several Mangave cultivars, ranging in size from the large ‘Macho Mocha’ to ‘Blood Spot’, which makes a compact rosette about a foot across. Most Mangave appear to be hardy to between 0-10 degrees, which make them, along with some Agave, among the most cold-tolerant succulents. 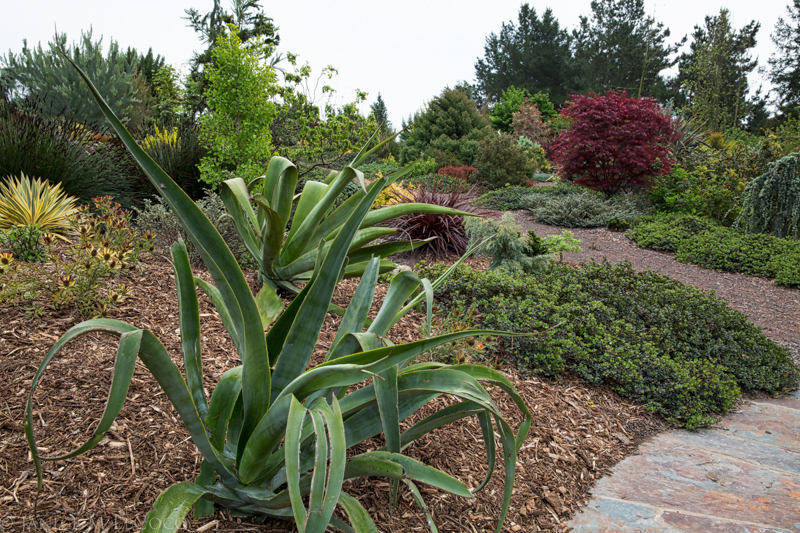 Aloe polyphylla, with its distinctive spiral leaves, stars in this bed, with Pinus strobus ‘Mini Twists’, Abies pinsapo ‘Horstmann’ and Cryptomeria japonica ‘Knaptonensis’ in the chorus. A string of Echeveria elegans rims the bed. So what about cultural requirements? 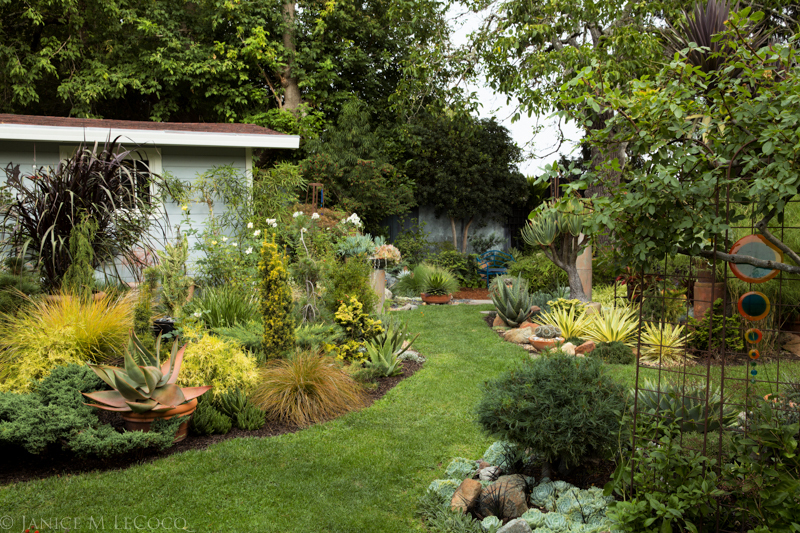 How can low-water succulents exist next to conifers and other woody plants, much less green lawn? Something isn’t right, right? Wrong! Firstly, most succulents need more water than is popularly supposed. While they can be classed a ‘low water’ plants, they are certainly not ‘no water’ plants. Those fleshy leaves store water but it needs to be replenished. The only tricky part is understanding what time of year each particular succulent grows, as this is when it needs the most water. Many are spring and summer growers; others, such as many Aloe, grow in winter months. Graptoveria ‘Fred Ives’, which flourishes in very well-drained soil and is slightly frost-tender, is an excellent choice for a container, which can be placed amongst complementary foliage and moved to shelter during the coldest months. 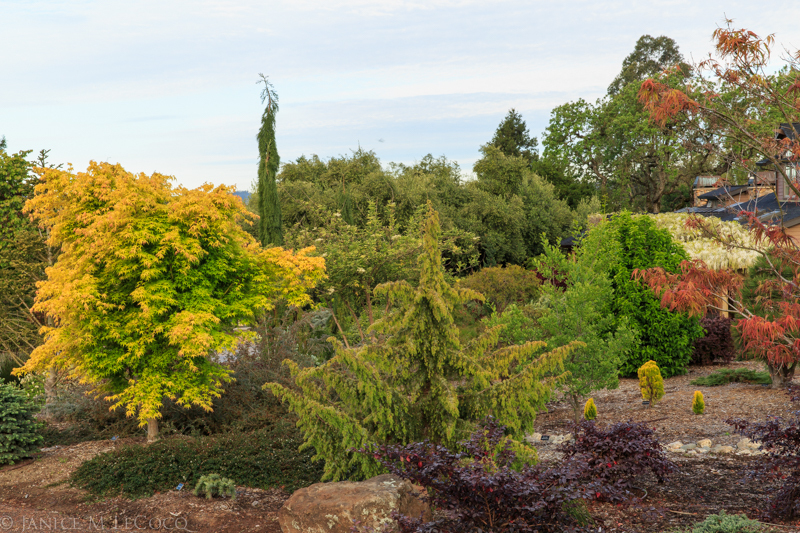 Secondly, many conifers and woody plants can do with less, or at least less frequent, water than many perennials. The fussiest succulents–those that are frost-tender or require extremely well-drained soil–can be planted in containers which both allow for removal to shelter during winter and provide excellent drainage. 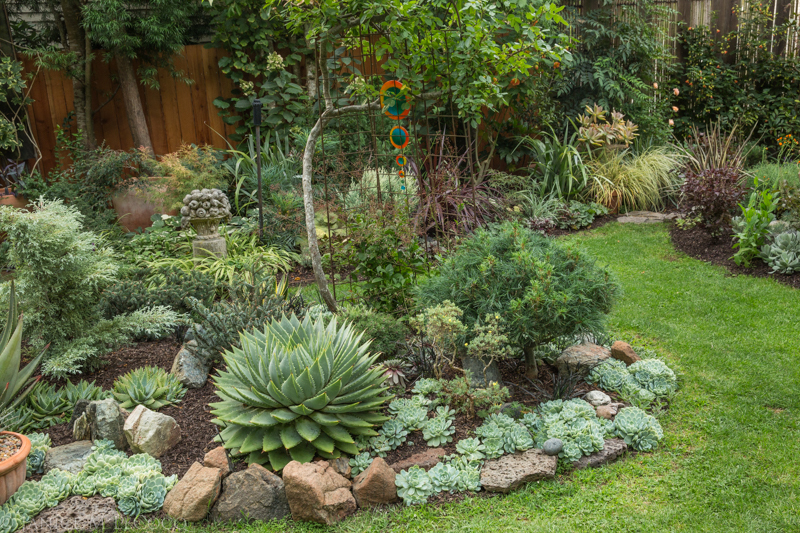 However, it is perfectly possible to grow succulents near other plants simply by creating a mound made up of 1/2 soil and 1/2 a gritty substance such as lava pebbles. 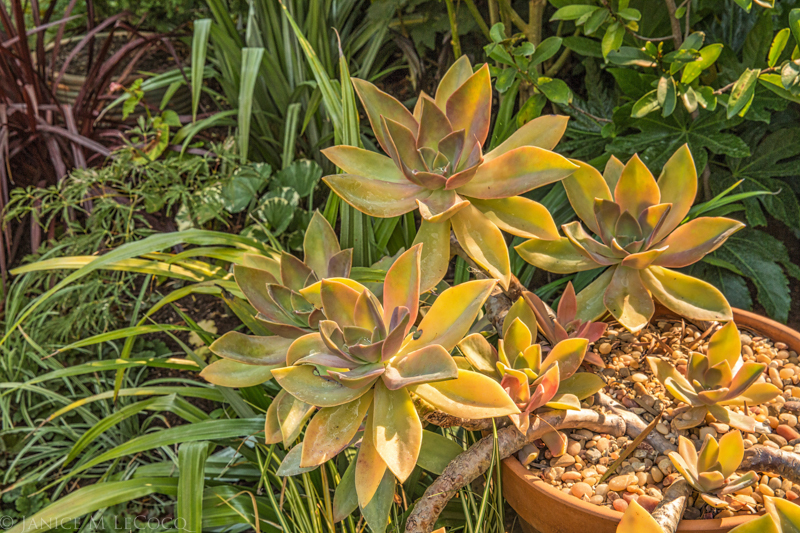 If the succulent is planted high up in such a mixture, it can receive the same amount and frequency of water as the other plants, and it will drain much more quickly. Most succulents do not like to be cold and wet at the same time, a challenge for those in Mediterranean climates. Mounding with pebbles or judicious use of containers generally works to provide enough drainage for all but the fussiest plants. 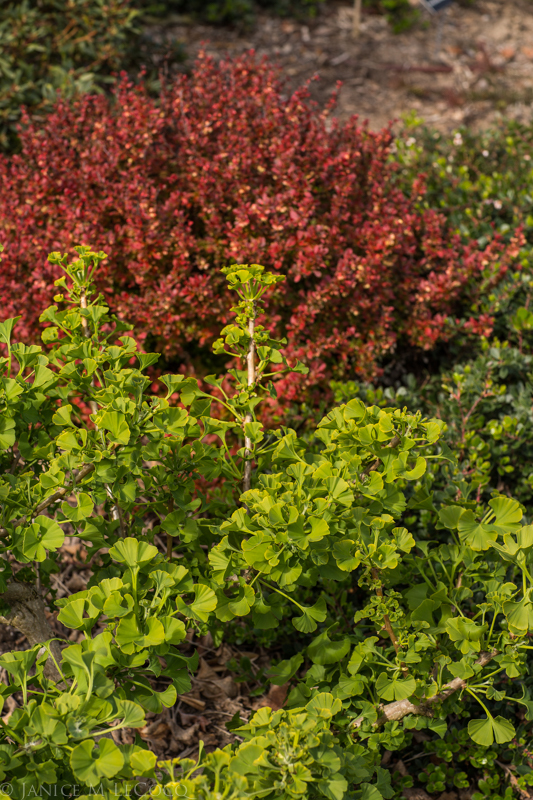 Planting next to a hardscape that warms quickly in winter sun can also create a more friendly microclimate. Agave vilmoriana (appropriately called octopus!) on a mound next to a flagstone patio. 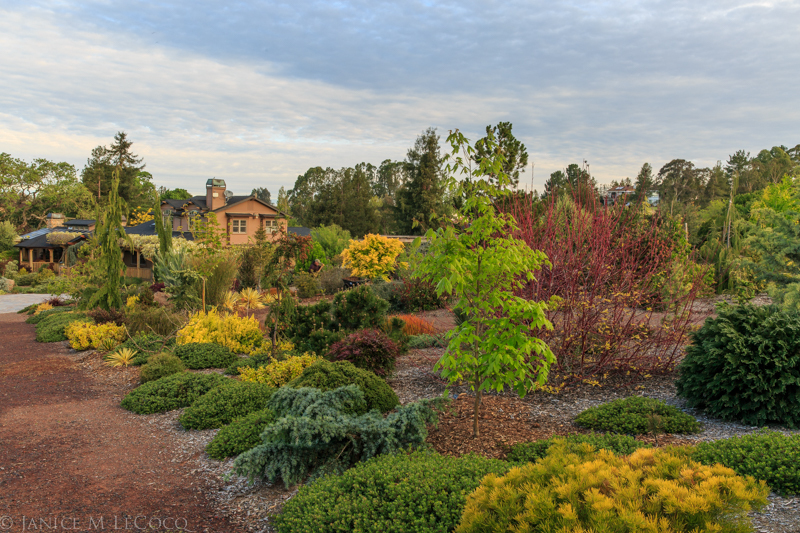 Fall is a great time to plant and winter a great time to ponder and plan. 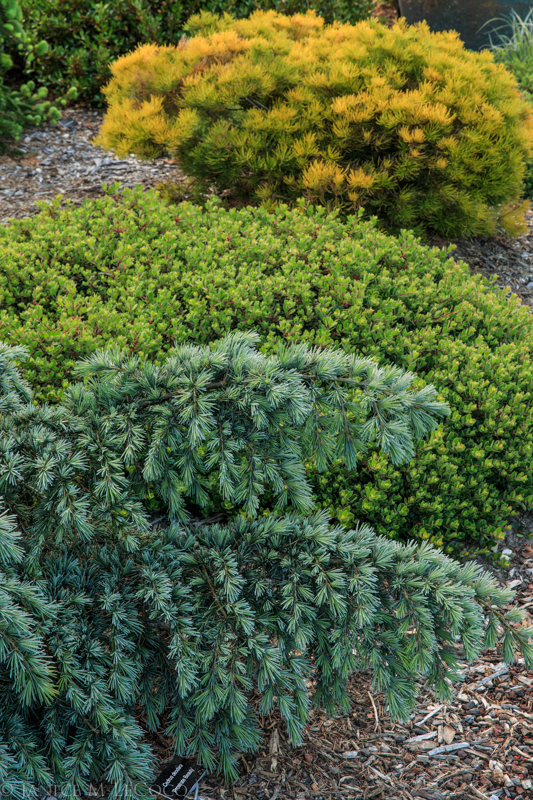 So when you are looking for the perfect plant for a particular spot, whether it is next to a spruce or a spirea, consider whether a succulent might fit the bill! 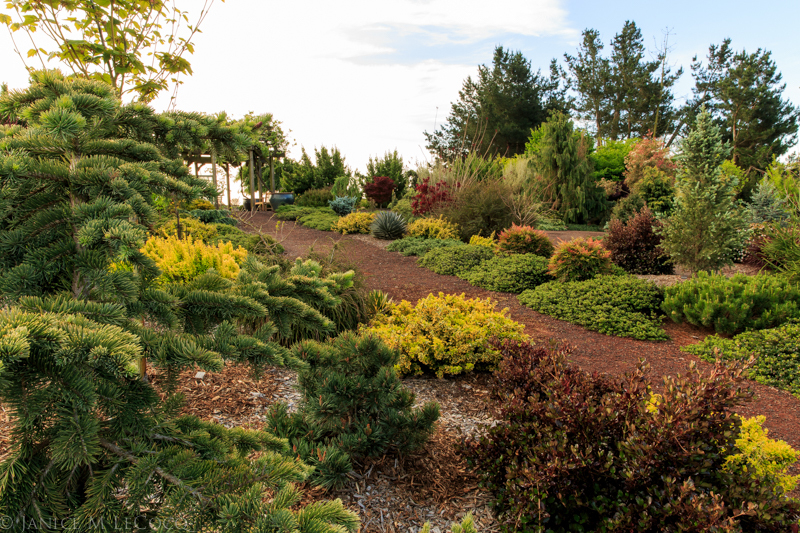 Succulents, conifers, woody foliage plants and grasses make a rich and varied foliage garden, with a broad range of colors, textures and forms. 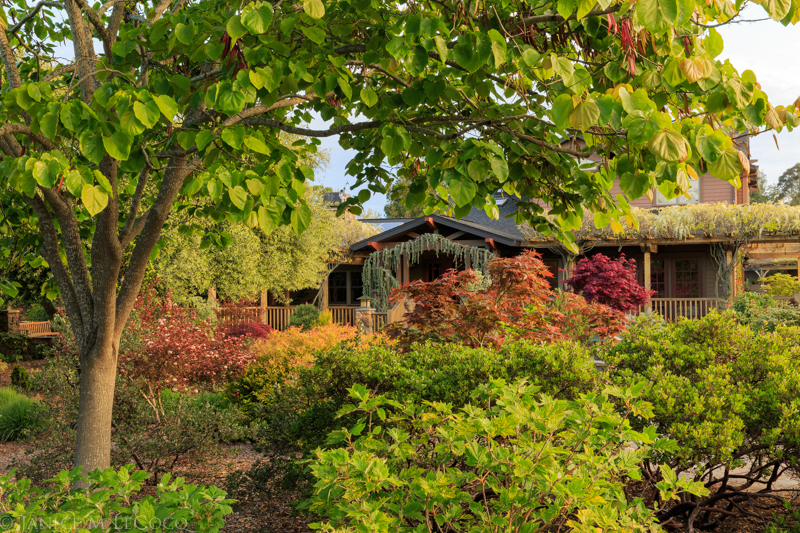 Categories: Color Palette, Design philosophy, Succulents | Tags: best foliage plants, conifers, foliage, foliage color combinations, plant selection, succulents | Permalink.